SmokeTip electronic cigarette is a new brand on the market, but since I’ve had the chance to test it recently, I can say that compared to other known brands, this is one solid two-piece vaping device that does what it’s supposed to do: it’s easy to draw from, and it produces a good vapor volume. Not to be overlooked in this time of economical crises, SmokeTip also comes at the lowest price. Starter Kit sells for just $59.95, and cartridges for $2.00/cartridge. If you are looking for a good, inexpensive e-cigarette, look no further. The starter kit contains 2 batteries, 2 chargers (wall and USB), and 6 cartridges. 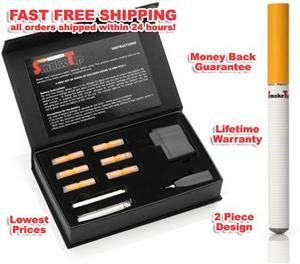 Battery lasts about 6-8 hours, and has a lifetime warranty, something no other e-cig company provides. SmokeTip offers a wide variety of flavor cartridges: regular, menthol, coffee, cherry, almond, apple, chocolate, peach, strawberry, vanilla, etc.